If you are here because someone close to you has died, please accept our condolences. A bereavement is always a difficult and emotional time. If you would like a member of the clergy or another member of the church community to visit, please do be in touch. Funerals are usually arranged by Funeral Directors, who will organise everything and make the arrangements for you. If the funeral is taking place at St John's, or being conducted at the crematorium by one of our clergy, the Funeral Directors will pass your details directly to the member of clergy concerned. They will then arrange to visit you to arrange the service, but do not hesitate to be in touch with the clergy if you would like a visit sooner. Further information about Church of England funerals can be found on the Church of England's funeral website. Please note that St John's Churchyard has been legally closed by Order in Council, which means that it can no longer be used for burials or for burying ashes. 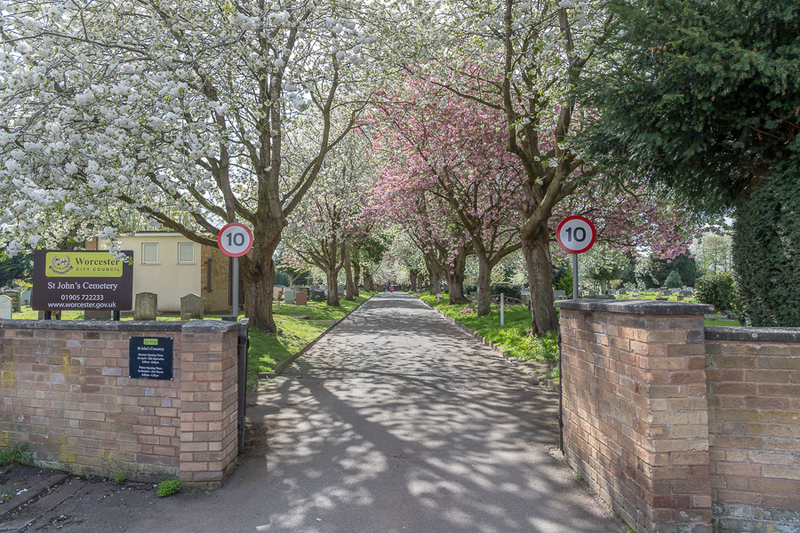 Burials are typically at St John's Cemetery, see picture above, or Astwood Cemetery. Following a cremation, the clergy can conduct services for the burial of ashes, which are normally arranged through the Funeral Directors. Grief does not end with a funeral, and the time afterwards can be very hard. If you would like a visit or further support, please let us know and we will do what we can to help.